Hi, great blog, and thanks for putting it all together. For this hobby, can multiple toddlers use the same playhouse at the same time? Thanks and no problem 🙂 I don’t think so but I haven’t tried it! I can’t seem to find the playhouse since the restaurant upadate! Help please! Do you mean you can’t find it at the swim center? Or in the store? Hi, thanks for the great blog as always! I am having trouble finding the playhouse, like the other comment said. It’s at the swim centre as before, but I can’t find it in the store… I don’t think I finished the quest in time, actually, so maybe that’s why? Do you know anything about this? Thanks in advance! I need more neighbors what should i do? Thanks for having a good blog, its been helpful. couldn’t gind the playhouse, came to your page, you always know. My toddler has now started her hobby. Hi, i was wondering if i can use the playhouse at the swim center instead of buying one, does completing the quest in time or not have any impact on this? Hello, it is no quicker buying one so if you only have one toddler working on the hobby, just do it at the swim center! 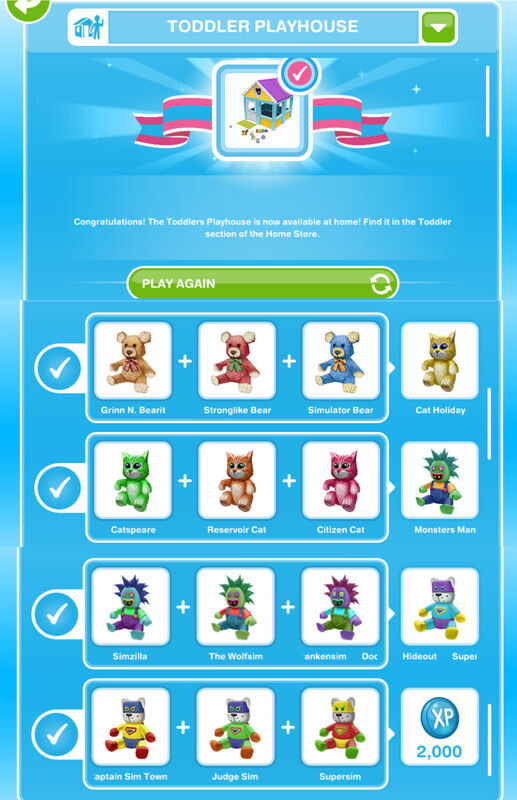 Hi, I was wondering if I clicked the 2 little bears action would I still be able to collect cats, monsters, and others? Or does the animal correspond to the specific action? I have already unlocked the cat holiday section of the hobby and I wanted to try and save some time. Thanks in advance!! I’m stuck on level 5… I’ve collected all the things and started over, but my toddler is stuck at level 5 and hadent gotten any higher on 5 in a few weeks. This is also happening with my teen idol teen and one of the adults in cooking. Is there a trick to this thing? you need to complete the whole hobby to finish it. I just got a toddler and went to the swim center. 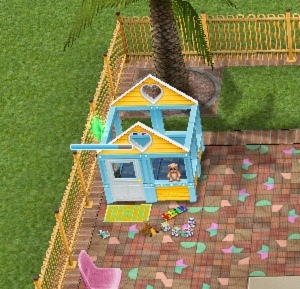 It won’t even let me click on the playhouse there. Am I missing something? have you done the in da clubhouse quest yet? No I haven’t. Thanks. That explains it. I finished the In Da Clubhouse Quest but I cannot find the clubhouse to buy anywhere and I’ve noticed other people mentioning this; do you know if it is some kind of glitch? Do you have any suggestions? I also wanted to say how much I love your blog, it has been super helpful!! Thanks so much!! I keep getting the same character in monster mansion…I have put my 5 toddlers to work on it over and over and it still will not give the last one to complete the set…this has been going on for weeks! Any suggestions? Where do I buy the playhouse? What section? you can only buy it once you complete the hobby for the first time. There is no option for my toddler to play at clubhouse at pool . im on level 21. Please help. Where are the items that are unlocked after each row?? I have completed this not once, but TWICE, yet cannot find the playhouse. I have looked in my buy section, cannot find it anywhere. I went to the hobbies/jobs building in town, and cannot find it there either. Where is it? I did not finish the quest in time, as rarely do I, as the game seems rigged to never give the needed game piece unless I spend a fortune on lifestyle points as a gamble (I did it twice, never got what was needed), or VIP and I dont have any of those. Please help. THANK YOU for all the help I have got from your blog!!! Hello my hero! I only get 1 xp each session of monster mansion! I also keep getting the same toy over and over. It is quite tiresome and feels hopeless. One xp every two hours will be quite a long hard road. Any ideas or comment? Thanks for the great site! Sorry but there isn’t much I can suggest over than keep going, I know its annoying but you will get them eventually! Why i can not add you as a friend on facebook? When i tried to search using your link it keeps sent me to my facebook home and i only discover your fans page. Nice blog by the way 😀 good to have someone who post about sims very specifically. You need to buy a cat from the pet store then the toddler can select the option on the cat. Hi! Have you had trouble with this hobby since the update? Before the update I could finish the hobby at a reasonable speed. Now it takes multiple weeks of constant playing to get the third Monster Mansion doll… what on earth is going on?? Even before this update it took me a long time to complete this hobby! I am on in stiches quest, but I want to get my sims married beforehand but my toddler isn’t getting the last collectible. I NEED 6 LIFE POINTS TO GET THEM MARRIED AND THAT IS WHAT SHE WILL EARN! Any tips on getting it?